The House of Representatives today (September 1) started its review of the P1.645-trillion national budget submitted by Malacañang. Rep. Emilio Abaya of Cavite, chair of the committee on appropriations, has earlier promised a thorough deliberation of the Aquino administration’s proposed budget. Sec. 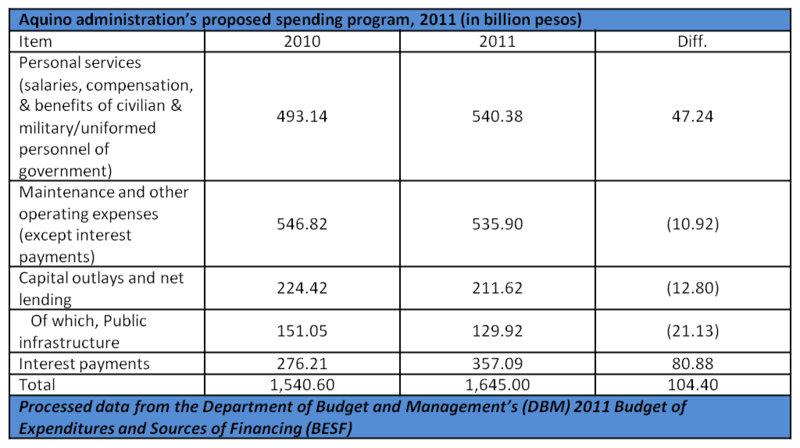 Butch Abad of the Department of Budget and Management (DBM) called the proposed 2011 budget a “reform budget”. The first budget of the new government is supposedly anchored on the basic governance principles of, among others, fiscal responsibility to reduce debt and bias in allocating resources for the poor. Such a heavy debt burden means that fewer resources are available to spend for social and economic services badly needed by the people. What makes it doubly unjust is that many of the projects and programs funded by these debts did not benefit the people, or worse, even made life more difficult for them while private contractors, corrupt government officials, and the creditors rake in billions of pesos in taxpayers’ money. Many of these anomalous and questionable loans can be easily identified. Take the case of the notorious bridge projects undertaken by the previous administration. In June 2008, the Commission on Audit (COA) released its findings on selected bridge projects undertaken by the Arroyo administration from 2002 to 2006, which were funded by various loan agreements with foreign creditors. 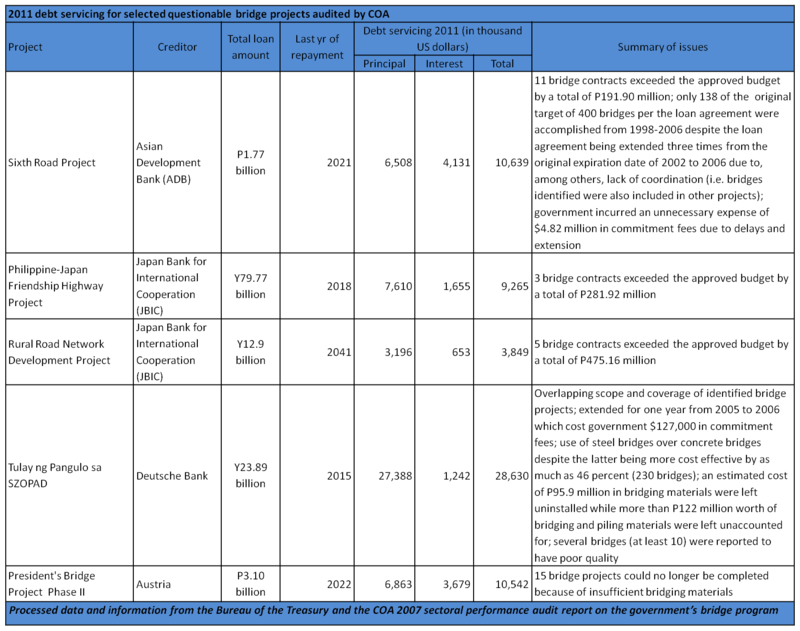 The COA noted a number of “lapses in the process of implementation” of these bridge projects such as uninstalled and unaccounted construction materials, use of expensive materials despite the availability of a cheap alternative, project delays that resulted in commitment penalties, construction of bridges in inappropriate places, overlapping of bridge projects, poor quality of constructed bridges, projects overshooting the approved budget, etc. To be sure, these foreign debt-funded bridge projects exposed by the COA are just a small sample of the many anomalous loans incurred by government and unjustly being passed on the people. Not included in the table above, for instance, is the First National Roads Improvement Project (NRIP) in which the Philippines borrowed $150 million from the World Bank. The loan closed in March 2007 and we have already been servicing our debt to the World Bank when the country learned that five Filipino and Chinese contractors that participated in the project were involved in bid-rigging. For 2011, we will pay the World Bank $14.74 million (about P663 million) in principal amortization and interest payments for the anomaly-ridden NRIP and the country will continue to service the loan until 2020. 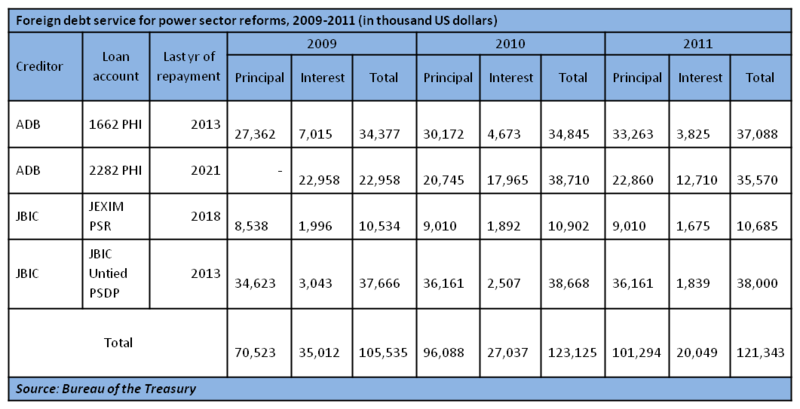 Aside from infrastructure projects, there are also programs bankrolled by foreign debt that introduced neoliberal structural reforms in the Philippines. One example is the ongoing power sector restructuring program that will supposedly address high electricity cost and power supply insecurity through privatization and deregulation. But after many years of restructuring, what we have are frequent brownouts and monthly increases in our electricity bills while the auction of state-owned power assets has been repeatedly marred by irregularities (the latest case is Angat Dam privatization) and industry participants again and again manipulate electricity rates. Worse, taxpayers have been paying for the debts used to implement these anti-people power reforms. The power sector restructuring program, which included the bribery-ridden railroading of the Electric Power Industry Reform Act (EPIRA) in 2001, has been mainly funded by the Asian Development Bank (ADB) and the Japan Bank for International Cooperation (JBIC). For 2011, the Aquino administration wants us to shell out $121.34 million to service the principal amortization and interest payments of four loan accounts with the ADB and JBIC for the implementation of power sector reforms. (See Table) The amount is on top of the debt servicing, worth $151.07 million in 2011, for the loans incurred by the National Power Corporation (NAPOCOR). A more meticulous review of Philippine debts will certainly yield more anomalous transactions ranging from loans associated with the privatization of water utilities, loans for the mandatory importation of agricultural goods including rice from the US, loans used in infrastructure projects fraught with corruption, etc. Our resources are indeed limited, constantly undermined by a fundamentally weak and backward economy and systemic corruption. Thus, lawmakers, as they review the 2011 budget proposal of the Aquino administration, must be pressured to take a serious look into these questionable and anomalous debts. We must compel them to at least suspend payments for these debts (and later work towards their complete repudiation). Congress can pass a 2011 budget stipulating that certain debts must not be serviced due to unresolved issues of corruption, program failure, etc. This move will also challenge President Aquino – will he veto such a budget and choose to honor his predecessors’, including Gloria Arroyo’s, illegitimate debts? Servicing debts that did not benefit the people and the country amid chronic poverty and hunger and severe lack of social services is not only immoral and unjust. It is also inconsistent with genuine and sustainable development since it deprives government the capacity and the resources to invest in its people and spur the economy. ← A scintillating 7.9 percent GDP growth? Thanks for sharing the analysis. goes to foreign debt service? external, as against external debt? how much internal vs external debt? hi. sa total debt service burden (interest & principal), it’s 66% domestic, 34% foreign. nasa 2nd table ito actually. if we repudiate debts immediately, will not IMF-WB cut us off world economy and our economy will suffer? could we think of “debt for nature” swaps by international diplomacy so our president can focus on his job of reducing external debt burden? could we campaign for passage of RH or RP bill even as Church leaders are against its passage? Bylegislating Islamic finance as secondary system in the country, we can effectively address our external debt by first, having an alternate source of fund, empowering the government to impose moratorium on our IMF debt; second enabling Muslim (Petro-dollar)investors to gain access to Philippines via Islamic financial infrastructure system which they presently avoid; thirdly, to enable the Philippine local business to interphase with the Islamic financial system worldwide in the field of banking & finance, capital market and takaful insurance; and fourth, increase employment and development in the country that we dont have to commit crime just to bring food on the table, etc.